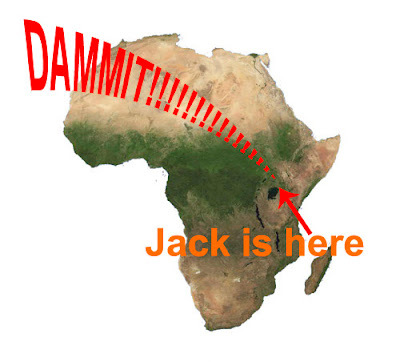 The Jack Sack™: The Dawn of Dammit: "24- Africa"
Tonight, a whole new continent will hear Jack Bauer scream "Dammit!" 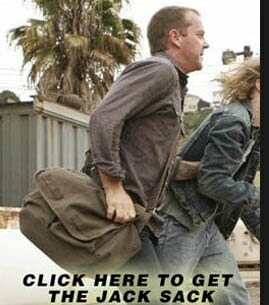 Ah, the global village gets a little smaller in "24: Redemption." I'll have reactions to the 2-hr t.v. movie as well. And here's Amy Vernon's advanced review. Jack's jacksack was different! It was lighter and had narrower straps!!! Delicious taste. How can they tease us so? Never enough Jack! The Jack Sack gets the occassional bit of cosmetic surgery. In other words, Bauer must have accidentally used bleach when washing it since we last saw the show. Robert Carlyle had a great "Dammit!" when he spoke to the Embassy dude.